Hanukkah is already here, so Happy Hanukkah to those of you who celebrate that blessed holiday. Christmas and winter are on the wind and getting closer every day. The Christmas holiday season is special to me for many reasons, but especially the wonderful people in my life, including you. We have been pounding out and filling up Christmas Surprise Packages like crazy. We know we’re doing a good job and making you all quite happy, because many of you have been telling us so or ordering your second or third Surprise Package. Awesome. That’s the whole idea, making people smile and delivering Christmas joy to as many people as possible. Two new things: A new digital Palladium Catalog is now available for your perusal. It should be a helpful resource and good for selecting items for the Wish List of your Surprise Package. Palladium Gift Certificates are also now available, because you requested them. Enjoy. Otherwise, my focus has been three things, 1) spreading Christmas cheer every way I can (to you that’s the Surprise Packages and other sales), 2) finishing the Rifts® Bestiary, and 3) getting the next several other books into production (mainly assigning artwork and wrangling freelance writers). 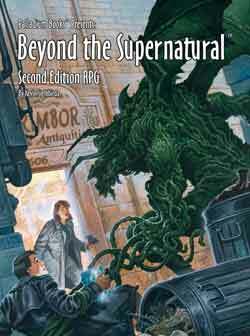 I’m happy that people are digging the release of BTS Sourcebook Boxed Nightmares™, Nightbane® Sourcebook 4: Shadows of Light™ and the alien invasion Systems Failure™ RPG. I’m also thrilled that The Rifter® #82 shipped last Friday because it’s a great issue on the heels of several great issues. Some folks are understandably disappointed that The Rifter® will be going on an indefinite hiatus after issue #84, but we have some great stuff planned for #83 and #84. And a hiatus does not mean forever. And let’s not forget, as I stated in our Rifter® announcement, we are doing this in order to get a lot more new books into your hands. And boy oh boy, do we have some great sourcebooks and welcomed surprises in store for you. To make them a reality, we need to focus. I hope you know the Palladium staff and I are more dedicated than ever to bringing you great games, mind-bending sourcebooks and epic adventure for another three decades, God willing. So are the growing number of freelance artists and writers. To accelerate that process, we have to put The Rifter® aside for awhile. We love what we do and have so many new, bold ideas for products we can’t wait to share with you. The point is, show those you care about how much they mean to you. Not necessarily with a physical gift, but with a card, short letter, email, text, or better yet, a telephone call or a visit. Nothing beats hearing each other’s voice or being face to face. Reconnect and call to say, “Hello, been thinking of you.” I was thrilled to hear from my old Defiler friend. A sweet guy who was sort of the young Luke Skywalker of the gaming group and of the Defilers, and of whom I have only the fondest memories. I’m having lunch with another friend today and will enjoy a party at the neighbors later this evening. Kathy and I live on a street that’s like something out of the movie It’s a Wonderful Life, where everyone knows each other’s name, smiles, waves and stops to chat. It’s very nice and very different than the world I grew up in as a child. And this is the time of year to let the good people in your life know they matter. A phone call may be one of the most welcomed gifts of the season. So with that sentiment, I’m going to focus on good cheer and the positive. 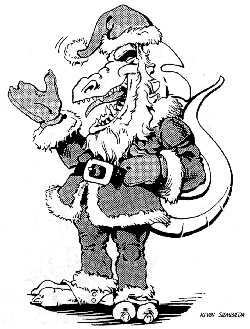 Our warm regards to every one of you from me and all of us at Palladium Books. We appreciate and value our extended Palladium family. (By the way, that’s you, in case you didn’t know.) Which is why I always post more of the comments from the Surprise Packages through the holidays. Everyone seems to enjoy reading them and we like to give a little shout out to some of our fans by sharing their comments and kind words. It has been long overdue, but we finally have a current PDF Catalog of Palladium Books® products available here on the Palladium Website and on DriveThruRPG.com. A big thanks to Rex Bardoll and Wayne Smith for making this possible, and to Scott Gibbons for planting the seeds to do so in the first place. You asked for them, so due to popular request, you can now purchase Palladium Gift Certificates for your gaming friends and loved ones who are difficult to buy for. The prompts should be pretty self-explanatory. You purchase the desired amount, fill out the email info of that person along with an optional gift message, and that individual gets an email with info on how to redeem the Gift Certificate and you get a confirmation email. Simple. Another big thanks to Rex Bardoll and Wayne Smith for doing the work to make Gift Certificates available in the Palladium online store and to Chuck Walton for his frequent reminders to get it done. Only 10 days to order and get your Palladium Christmas Surprise Package guaranteed in time for Christmas! IF YOU WANT YOUR ORDER or SURPRISE PACKAGE IN TIME FOR CHRISTMAS, YOU NEED TO ORDER OVER THE NEXT 10 DAYS! For most of you in the USA, placing an order over the next 10 days guarantees you get your Christmas Surprise Packages in time for Christmas without any concern. And without having to pay for a faster more expensive method of shipping! That gives you till December 17 to place orders in time for Christmas. The only exception is Media Mail, as it is slower and less reliable. If shipping by Media Mail, place your order BEFORE December 11 – and even then there is no guarantee whenever you use Media Mail. Note: When you place your order now and over the next 10 days, you avoid the Christmas rush and reduce the chance of your package getting lost or delayed in the mail! Shipping Considerations: When ordering, you need to factor in time for Palladium to process those orders (usually 24 hours, not counting weekends) and the actual transit time of shipping itself, generally 3-5 business days in the USA depending on where you live. 7-15 days in Canada. Do NOT include Saturday or Sunday as shipping days, because they are not. Get those orders in NOW to get your order or Surprise Packages guaranteed in time for Christmas without having to pay an arm and a leg for expedited shipping! Please make sure your address is complete and includes your Apartment Number. You help us and yourself by sending a long Wish List and making your order clear. - Media Mail: Least expensive but risky. Place your order via Media Mail by December 11 and you should get your Surprise Package by Christmas. HOWEVER, Palladium will NOT guarantee any package shipped via Media Mail to arrive before Christmas. Use this method at your own risk. Note: Media Mail, which applies only to paper goods, is the least expensive method of shipping, BUT also the slowest and least reliable method. The USPS will tell you 4-7 days for delivery, HOWEVER, experience has shown us that delivery time is more like 8-21 days during the Christmas season. Ship via Media Mail at your own risk. Note: If you want your 2018 Surprise Package quickly, DO NOT ship via Media Mail; use UPS or Priority Mail instead. Rare books and one-of-a-kind items like original art, numbered prints and gold editions CANNOT be replaced if lost or damaged in the mail. The risk and the loss is YOURS and the items, even books, will NOT be replaced if you ship via Media Mail. - UPS Ground in the USA is 3-5 days delivery to almost all locations other than Alaska and Hawaii. However, there can be delays due to weather, accidents and sheer volume. Place your order by December 15 to guarantee Christmas delivery. Those of you who live east of the Mississippi River may have till December 17. Since Christmas is on Tuesday, those of you east of the Mississippi should get your order in time, as UPS Ground ships to most locations in the east in 2-3 days, but it is a small gamble. Those of you living west of the Mississippi need to get orders to us no later than December 13 to absolutely guarantee delivery by Monday, December 24 or sooner. Barring unexpected weather or accidents, of course. - Priority Mail in the USA – Place your order by December 13 (should be a bit cheaper than UPS 3-Day Select). Priority mail orders placed as late as December 16 should arrive in time for Christmas, but cannot be guaranteed. - UPS 3-Day Select in the USA – Place your order by December 17 for guaranteed Christmas delivery. - UPS 2nd Day Air in the USA – Place your order by December 18. - UPS Next Day Air in the USA – Place your order by December 20 to receive the package on Saturday or Monday (Christmas Eve). - Express Mail in the USA – Place your order by December 17. - Parcel Post in the USA – NOT ADVISED. Placing an order by December 13 means you MAY get your order in time for Christmas, but probably not. There is only a 33% chance. We CANNOT guarantee a Christmas delivery using Parcel Post at this time. - December 6 – to our friends in Canada and overseas – We suggest ordering no later than December 6, but sooner is better as we cannot guarantee delivery in time for Christmas. Your package should arrive in time, but if there are delays at Customs, work strike, bad weather, etc., it might miss. Order sooner rather than later. Happy Holidays, one and all! Remember: 1. Palladium needs a day or two to process and pack orders, and we cannot ship on the weekends. As Christmas gets near, we will work our hardest to turn orders around as fast as possible. Order on Sunday, it should go out on Monday ... but maybe Tuesday depending on volume. 2. Surprise Package mitigates overseas shipping costs – take advantage of this while you can. The low cost of the Surprise Package mitigates the cost of shipping. It is, in effect, the equivalent of getting the books you want at retail, plus autographs, and paying the equivalent of only $5-$20 for overseas shipping! MANY overseas customers take advantage of the Surprise Packages for this reason! And it is likely the ONLY way for you to get autographs. Give it a try, we don’t think you will be disappointed. 3. Palladium Books has NO control over the shipping service once it leaves our warehouse, nor over the cost of shipping/postage, or the brokerage fees, Customs charges, taxes or any other related fees charged by other countries. Within the USA, Media Mail is the least expensive method of shipping, but also the least reliable and slowest. To our Canadian customers, we have no idea why it costs so much to mail books and product to you. So much for NAFTA making things easier. Game on. 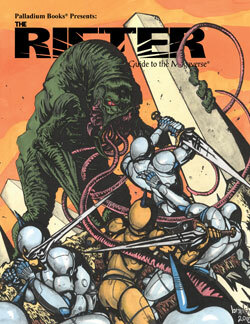 This 112 page issue of The Rifter® #82 shipped last Friday and should be hitting store shelves next week. Of course, it is available right now from Palladium Books. Snag yourself a copy along with one of the re-releases (Boxed Nightmares™, Nightbane® Shadows of Light™ and Systems Failure™ RPG). This is a great issue, packed with source material plus Erick Wujcik remembered. 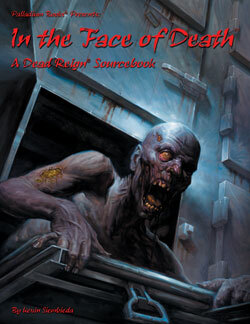 New: Dead Reign® Paper Miniatures Volume Three: Zombies, provides a set of recently turned zombies – mostly Slouchers. Paper miniatures by Michael Leonard. Dead Reign® Paper Miniatures Volume Two: Civilians and Dead Reign® Paper Miniatures Volume One: Survivors are available now. There are also paper miniatures for Heroes Unlimited™, Palladium Fantasy® and Rifts®. Also new is a PDF of the Palladium Books Catalog. And take a look at some of the free Sneak Previews of various titles. The latest being The Rifter® #82 with the Pyromancer O.C.C. 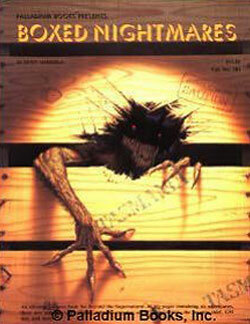 and Pyromancy magic, some Rifts® Bestiary monsters, HU heroes, bad guys, Nightbane®, and Erick Wujcik remembered. Recent PDF additions include Nightbane® Dark Designs™ sourcebook with 60 new Common Talents, 38 new Elite Talents, 18 new Morphus Tables, all other Morphus Tables collected and more. 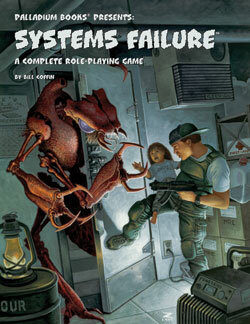 Systems Failure™ RPG, a 160 page RPG that deals with alien invasion and a post-apocalypse setting that is fun and dynamic. Civilization is on the verge of collapse when the so-called “bugs” invade and turn humans into zombie-like slaves. Monsters, heroes and fun. 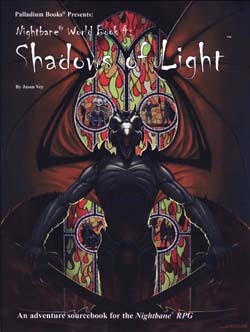 A complete RPG and setting. Rifts® World Book 34: Northern Gun™ Two: 256 pages of technology and fun. 30+ power armors, 30+ body armors, 15 combat vehicles, 45 vehicles (hovercycles, etc. ), 10 robot haulers, the Robodome and more. Bizantium and the Northern Islands™: the northernmost part of the Known World, the Cold Born, Necromancy ships made from dead sea serpents, 15 creatures, Random Sea Monster Generator, and more. Rifts® Northern Gun™ One. This fan favorite might be thought of as the big book of giant robots – an in-depth look at Northern Gun, 70+ weapons, 27 robots, NG O.C.C.s, key people and places, and much more. Mysteries of Magic™ Book One: The Heart of Magic™ with Wizards, their Apprentices, nearly 60 new magic spells and remember, magic and monsters in the Fantasy RPG are easily adapted to Rifts®, Chaos Earth®, HU2 and other settings. Wolfen Empire™ Fantasy sourcebook, the Great Northern Wilderness and Killer Winters, 12 Wolfen Tribes, Wolfen military and society, 15+ creatures, 5 full adventures, 101 adventure ideas, random encounter tables, notable people, places, plus FREE Sneak Previews of The Rifter® #80 & The Rifter® #81, and more on DriveThruRPG.com. The holiday season is always bonkers for us. We have all been putting in long hours on many fronts and will continue to do so, especially when it comes to trying to make every Christmas Surprise Package special. But it is also a joy. Something we are happy to do for you, so get ‘em while you can. Spread the joy of Palladium gaming to your friends and loved ones or get those sourcebooks you’ve been wanting, or try that new game setting you’ve been wondering about. But whatever you do, enjoy this time of love and giving with the people in your lives who matter most. May this holiday season be nothing short of wonderful, filled with laughter and joy. Ho, ho, ho. B.B. in Haltom City, Texas, writes, in part: Shalom and good fortune to you... your books give me a refreshing escape unlike any movie or video game. I’ll gladly take a personalized collection over any modern console. R.K. in Sault St. Marie, Michigan, writes: Thanks in advance. Great picks so far. Thanks for the great drawings in the Splicers® RPG you sent in the last Surprise Package. Was very cool. J.M. in South Hadley, Massachusetts, writes: We already bought a Christmas Grab Bag this year and loved it so much we needed another one. S.S. in Benson, Minnesota, writes: Generating this Wish List was TOUGH! Went to youtube for inspiration and found unboxings. That’s where I saw the maps! This won’t be my last Surprise Package. Thanks. P.D. in Tucson, Arizona, writes: I love Palladium games going back to TMNT® and Robotech® in the early 1990s. Thanks for making games I love. C.F. in West Palm Beach, Florida, writes: Great stuff! Love this deal. Try to get one every year. 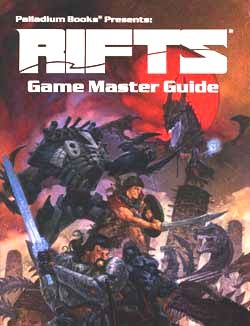 P.M. in Commerce Township, Michigan, writes, in part: I’ve been playing Rifts® for a long time. Unfortunately, I fell out of the game for the last 8-10 years and trying to get back into it with my brothers and sons. Looking forward to introducing it to a new generation of players and having some creative fun... Excited to start up a regular group again! W.K. in New York, New York, writes: I have almost every Rifts® book (they’re so good, yay! ), and I’m now completing my collection of Palladium Fantasy books. J.H. in Cadillac, Michigan, writes: Love the books. 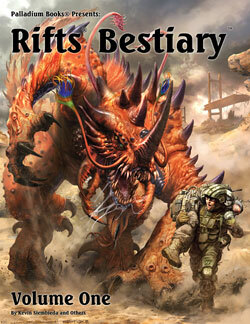 I have one suggestion doing the Rifts® Bestiaries™, why not do a similar book for O.C.C.s, men at arms, men of magic, etc.? Keep up the great work. H.B. in Orem, Utah, writes, in part: ... been a fan since 1986. Thank you for being part of my life and my son’s too. D.N. in Northwood, North Dakota, writes, in part: I’m really looking forward to the 2021 Palladium Open House and the big 4-0h then. I hope to bring my brother-in-law with me to have all the fun we have there. Have a great Thanksgiving, a Merry Christmas and a Happy New Year! J.M. in Elliot Lake, Ontario, Canada, writes, in part: ... Is the Titan Robotics™ book combined with Haunted Tech™? ... Thank you for the X-Mas Packages and 30+ years of inspiring my imagination. Keep up the great job! E.H. in Filer, Idaho, writes: I am super excited to dig into the new Nightbane® and Rifts® books I got the other day from DriveThruRPG. Can’t wait till more come out. Thank you guys for creating such interesting books. K.B. in Westminster, California, writes, in part: I love Rifts®. Trying to rebuild my collection. I’m going with a Coalition theme Wish List this year. Keep Truckin’. ... If you had a slogan I’d end my comments with it, but I’ll just say, Palladium rules! C.T. in Sante Fe, New Mexico, writes, in part: Thank you so much for another great year of gaming, and for once again making the Christmas Surprise Packages available again! I really look forward to this time of year thanks to you!